Begonia flowers encompass a variety of shade-loving plants that are grown for their showy flowers and foliage. The blossoms are pendulous or draping and the foliage has unusual edging, bright colors and different shapes and textures. Some begonia foliage even have unusual markings with spirals and patterns while others have a velvet-like texture. Begonia blooms require well-drained, fertile soil and are ideal tucked into front flower beds because of their low growing, spreading ability. River Nile begonia is a perennial flower that grows in clumps. Its green leaves are ruffled and edged in a deep bronze color. River Nile begonias grow 6 to 12 inches tall and wide, making this spreading flower ideal along garden borders or nestled within a container. River Nile begonia prefers part to full shade and well-drained, nutrient-rich soil to thrive. Water this hardy begonia when the soil is dry and avoid overly moist conditions. River Nile begonias require deadheading or removing spent blooms, as soon as they become visible. This ensures new, fresh growth throughout the season. They are hardy in USDA zones 10 to 11. Escargot begonias have a snail-shaped curl at the base of each leaf, hence the name escargot begonia. The colorful foliage is striking when planted along a flower bed border to provide an unexpected burst of vibrancy to the landscape. Escargot begonias grow up to 12 inches tall and wide and have a clumping growth habit. Their showy, variegated foliage has burgundy and green colors swirled together and looks lovely nestled with other plants and blooms. The escargot begonia requires part to full shade and well-drained, nutrient-laden and humid soil. These low-maintenance perennials begin blooming in spring and summer for a beautiful addition to the landscape. They're hardy in USDA zones 10 to 11. The winter begonia is a perennial flower that has a spreading growth habit. Its large, bright green leaves have fine hairs that grow across each leaf. 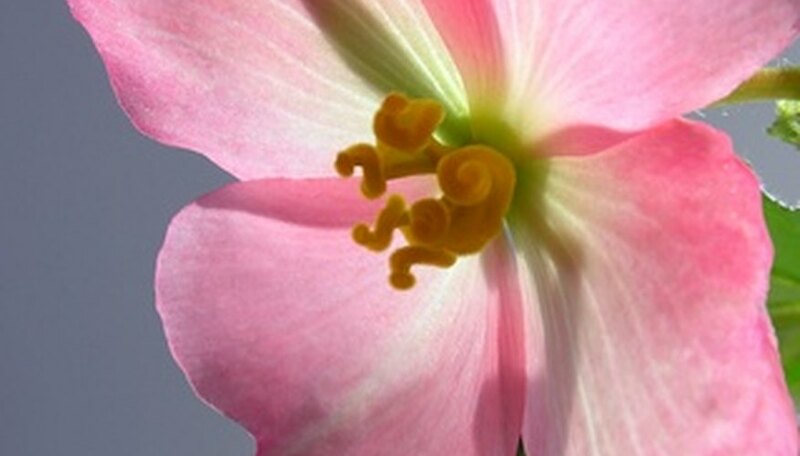 Beginning in the spring, the winter begonia has small pink blooms that emerge to contrast with the green foliage. Winter begonia grows up to 12 inches high and wide and requires medium moisture to survive. It requires full to part shade and a medium amount of moisture. Winter begonias are ideal flanking a front walk for lowing growing foliage and blooms. Every three to five years they can be divided into clumps to use around other areas of the garden. They are hardy in USDA zones 5 to 8.